They say a picture is worth a thousand words, so I hope the picture I gave you last Wednesday described how I felt inside: like God had punched me off the swing, and He and Bruce ran away, leaving me crumpled and crying on the playground. To look at me, though, everything seemed fine. We were coping. I exercised a lot. I traveled more than usual with the children, spending extra time with faraway family. I kept busy with work on my house, paying the bills, and developing friendships with some amazing people God sent my way. But inside me the vision of getting knocked down onto sharp stones grew stronger. I missed my husband. The missing and loneliness became like a constant physical ache. Ice formed on God’s silence and His distance seemed further. Unanswered questions—What should I do? Where can I turn? Where do I even start?—nagged relentlessly. This was my complaint. I felt it was legitimate. And I felt in good company, for even David complained in the Psalms every once in a while. But, God’s door remained closed. I put my ear to the door and listened. His house was silent. No one was home. I kept knocking anyway. After two or three days of this knocking, ranting, whining and continually complaining to God--just as I started getting used to the bitter taste of it--a small thought about the size of a pebble lobbed into my head: I was wrong. Wrong? Me? Hmmph. I hate to be wrong! How could that happen? Did I forget something? You know what? I did forget something. I’d forgotten one important fact: there was more than one verse in the Bible for widows—there was an entire book about us! The book of Ruth told about three widows. Why hadn’t I looked at it before? I decided to read it. And so I did. I read it once, then twice, then over and over. I went to my church and dusted off the old commentaries lining the shelves of an unused room. I clicked my way through the Internet. I became obsessed. Like putting a puzzle together, I found pieces of information that only a widow would recognize and appreciate; pieces that were key to the whole picture. Without fail, every time I opened to the book of Ruth over the next two years a fresh insight came to me. I asked every question—who, what, where, when, why and how—of every phrase, sometimes every word. Fascinating details of the history and the culture emerged. Ruth and Naomi became like real people to me, like dearest friends. I shared fellowship in their suffering through my observation and study of God’s Word. God had an extraordinary story for these widows! But, I wondered, did they know what He was doing? Did they know their story would be in the Bible? Of course not. They thought they were nobodies, like you and I. Ruth only knew she wanted to follow Naomi to God’s Promised Land, become one with Naomi’s people and belong to Naomi’s God. She clung to Naomi like a life preserver. Naomi only knew that God Almighty had brought her hardship. She thought God had turned against her and was punishing her. 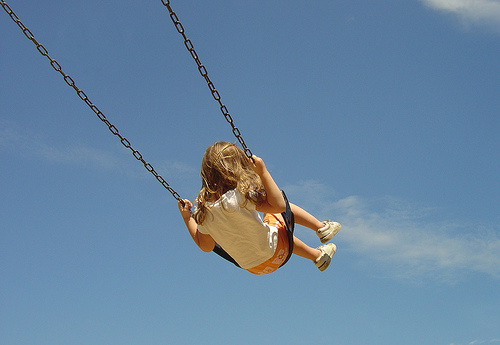 Maybe she, too, felt like God had punched her off the swing--or worse. Yet she didn’t let feelings determine her faith. Her life showed me how real faith turns to God when it’s hardest to do so—when life isn’t safe, when it’s hard, when it’s messy, when it hurts. She did what faith required. Despite her bitter feelings and pain she put one foot in front of the other and headed back home to the Promised Land, the first step leading to joy. Last Wednesday I said I'd tell you how joy gets planted. So here's the very first step: it may sound too obvious and simple, but it's monumental: Prepare for the journey ahead. See where you're at and look at the direction you're pointed. Are you more like Naomi (full of despair) or more like Ruth (full of direction)? Are you as determined as each of them? Do you believe God has a story for your life, just as He did for theirs? Do you trust you're in God's Promised Land already, are you on your way, or do you need to get started? Write down your answers. Wow, I'd love it if your shared them in the comment box here on the blog, but you can keep them to yourself, too. Either way, understand that they mark your starting point on this journey to joy, so its important that you write them down somewhere. In a little while you can look back and see how far you've come. If your mind is blank, if you don't know where you're at, give yourself some more time to get rested. Ask God where you're at and wait for some understanding over the next week. Let me know how I can pray for you; anticipate that God is at work in your life and begin to take notice of the things He's already done for you. Prepare. Anticipate. Hope. Psalm 126:5. Ferree, I feel so blessed reading this. I am not a widow today, but I could be tomorrow or by the end of this day. You are helping me prepare as well as give counsel to those widows in my life. Thank you for sharing your heart and your pain and your wisdom. Praying many will realize the treasure who is Ferree. Dear Elaine, Ps. 119:92 says it all--If your law had not been my delight, I would have perished in my affliction." I was amazed over and over and over again at the sufficiency of Christ and His Word. Oh, that all could taste and see! God Bless you as you cherish each moment today. Ferree, I love your honesty! Like Elaine I haven't experienced widowhood, yet, but these past two years I've been on a journey of grief due to the choices of one of my kids. I'm sure grief has different levels of intensity, but I'm beginning to think it demands a similar process. I could relate. You're words challenge me. Thank you! I read the book of Ruth within weeks of becoming a widow. It was a great source of encouragement to me. I try to be like Ruth. I've been reading Mary Beth Chapman's Choosing to See, and she keeps referring to their loss as a sacred trust. That's hard to understand from an earthly perspective, but I think it will all make sense in Eternity. Somehow we are to glorify God with our lives as we navigate through this grief with Him.